Since the release of the film „Back to the Future“ enthusiasts from all over the world dream of inventing the Hoverboard of Marty McFly. 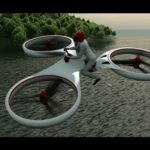 Today we will talk about the most famous flying devices: from hovering boards, powerful jetpacks and Trikopters to large personal inventions that can turn you into a superhero for a few moments. Thanks you for watching.